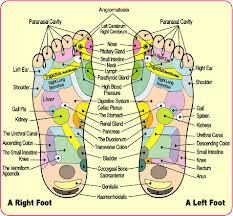 Reflexology is a complementary therapy and so acts as preventative health care i.e helps the body to resist illness. It’s a method for activating the self-healing potential of the body in an holistic way which can reduce reliance on pharmaceuticals. It improves circulation and helps cleanse the body of toxins. It reduces stress and induces deep relaxation. It works towards balancing the whole system (homeostasis). It raises awareness of potential foot care issues.It is believed to improve general health by targeting corresponding problems in the the body. It’s believed that the feet are a map of the body and by applying pressure to certain areas known as reflex points the body can be re-tuned and brought back into balance.During a treatment this manipulation is generally applied with the thumbs, hands and fingers using an oily or powder medium. Acupuncture and acupressure operate on the theory that by applying pressure to specific points of the body channels of energy are unblocked, so aiding the body to recover. There is evidence that ancient cultures, in China, Japan, Indian, Russia, North America and Egypt worked on the feet to promote good health.Many of these ancient and new ideas have been combined and developed to become reflexology. Reflexology isn’t diagnostic and never offers a cure but has been known to help alleviate many of the symptoms of bodily disorders such as: hormonal imbalances, digestive disorders, poor bowel and urinary function, headaches and migraines, mental stress, sinus problems, respiratory disorders, fertility issues, maternity and post natal conditions, poor immune system and insomnia.